For the past nine years, Misameach has touched the lives of thousands of children and their families, and now you have the opportunity to be a part of that magic. Misameach is an organization wholly devoted to bringing a ray of light and joy into families of those afflicted with serious illness. They accomplish this through a breathtaking array of programs and services including professional and heartfelt bedside entertainment, a massive multi-media lending library, special parties and events, personal wishes granted and so much more. Hundreds of families can attest to the miracles Misameach has wrought in their own lives. 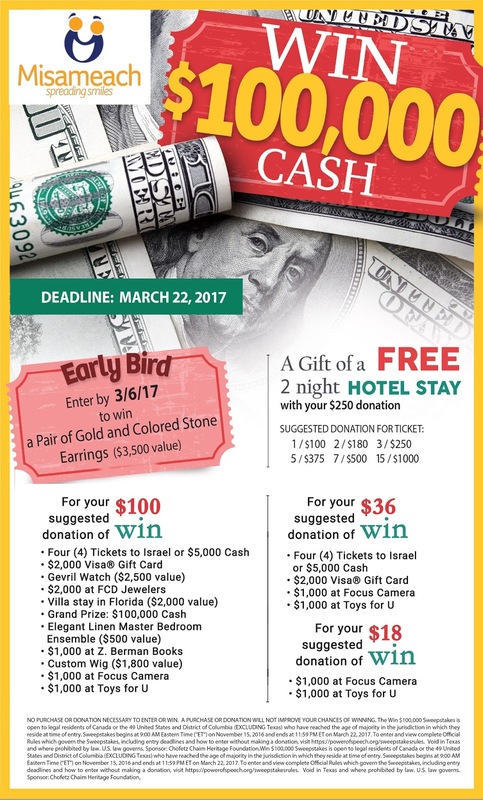 Now, Misameach is offering you a share in this mitzvah with their third grand raffle campaign, offering many prizes including $100,000 cash. Time is running out as the deadline nears. By partnering with Misameach you too can make a difference in the lives of countless cholim in our area. Click Here to watch Misameach's mid winter event. Click Here to read an article about the organization.